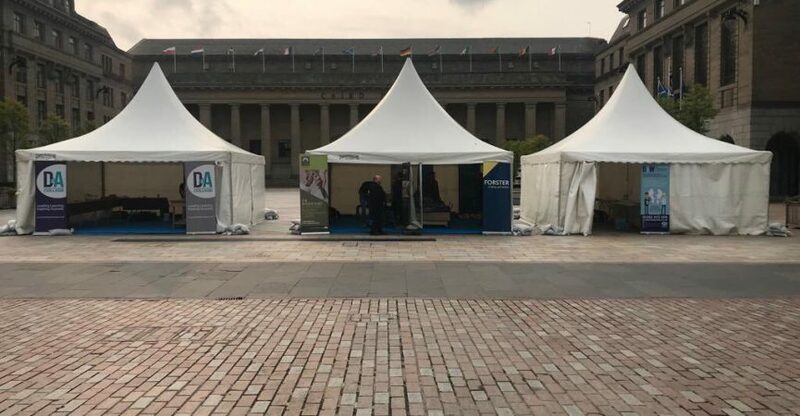 On Monday 27 August and Tuesday 28 August the very first Dundee Traditional Building Skills event took place at City Square. This event was co-ordinated by Historic Environment Scotland and Scottish Traditional Building Forum, with local support from the DYW Dundee & Angus team. Forster Roofing, Historic Environment Scotland and Dundee & Angus College provided hands-on opportunities for pupils on the day. Pupils came from Dundee and Angus to take part in this amazing opportunity. Split into a morning and afternoon sessions on each of the two days, pupils were given 30 minutes to get the most out of each and every workshop. The first session was provided by the Construction and technology department of Dundee & Angus College, they showed pupils various techniques of how to paint including how to create a marble effect. D&A College also gave pupils the option of making either a bird house or a tea light holder in the joinery workshop. It was lovely to see how proud the pupils were after they had made these. The next session offered a stone masonry workshop hosted by Historic Environment Scotland. In this workshop the pupils were given the opportunity to carve their initial into stones using traditional methods, they also found out lots of information on other types of stone masonry. Historic Environment Scotland is the largest employer of apprentice stone masons in Scotland. Any young people who are interested in this career could help preserving our heritage for future generations, including repairing and creating gargoyles. Or after their apprenticeship is complete they could strike out on their own and work on a huge range of project, everything from housing to memorial masonry. The final opportunity was with Forster Roofing where the pupils were learning the different aspects of how to slate a roof. They got to shape their own tiles onto a mock roof and they were given a demonstration on patterns and ways to slate roofs so as to not let in water or have any slates loose. Pupils all left the event happy and thinking about the new opportunities that have now been opened up to them through the different ways they could turn these hands on trades into their careers. Some of these pupils are now considering attending college or gaining fantastic experience and a qualification through an apprenticeship. It was also amazing to see girls take part in the event and see them be inspired by these trades. On Tuesday 28 August was the Inspiring Professional Careers in Construction held in the Caird Hall. This event gave the pupils the opportunity to find out more information on careers within the construction industry. They were given taster sessions including a Lego challenge, teaching them about architecture, and were shown the inside of the spectacular V&A building through virtual reality goggles to show them the local importance of civil engineers.